Home / General Interest / Thank you, Coach! Congratulations to our NACD coaches! 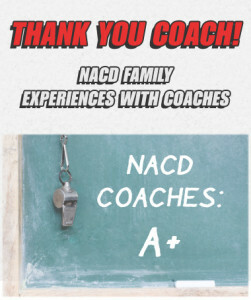 It has been a year since NACD added coaches to our staff, and what a successful year it has been. Our coaches have been very well received by NACD families, old and new, and have become an indispensible part of our team. But more importantly, with the addition of coaching, our clients are making better and faster progress on program, and our parents are feeling more empowered and better able to implement program. Our coaches serve as the primary contact for our families. With frequent phone appointments, coaches monitor clients’ progress, while troubleshooting and problem solving as needed. They answer questions and address parents’ concerns, provide encouragement and practical strategies, break program down into manageable pieces, help with the pacing of the program, and ensure that priorities are met. Our coaches have established high standards for prompt and immediate responses and assistance. This complimentary service by our team of dedicated coaches is available to all our clients. All of our coaches are highly trained professionals, as well as parents who have done or are currently doing program with their own children. This gives them the unique ability to combine professional advice with a personal understanding of the day-to-day challenges of implementing program. “I am very thankful for the coaching service that has been made available! It helps to make sure all of the activities on the program are done properly and the maximum benefits are being achieved. “When I first learned of the NACD coaching service, it felt like yet one more thing in my never-ending to-do list. I couldn’t imagine that adding one more thing would make a difference in my ability to accomplish more program! “My coach has provided me with a connection: a connection to a community; a connection that is empowering; a connection that has filled me with a true sense of hope for all the possibilities. Glenda not only “talks the talk,” she has and is “walking the walk.” I read Glenda’s bio when I first learned that she would be my coach, but it is the little glimpses she gives me into her life with each phone call that are inspiring. I think of her on days that I feel defeated, for she is not only supporting me but providing a strong foundation to draw from. When I received our very first program, I felt overwhelmed and not sure if I was capable of providing my son with every exercise that he required. Glenda told me to take it one step at a time and broke the program down so it was manageable and achievable. I look forward to her phone calls as I am now accountable and feel a sense of value in my son’s developmental goals. She is also available for emails in between phone calls when I have any questions. She never makes me feel like any question or concern is trivial and is very prompt in her response time. Even though Glenda is the “Coach,” she has made me feel like the “Captain” of the team. She constantly reminds me that my hard work and commitment is what is bringing about a positive change within my son. Perhaps that is the greatest gift that she has given me. I have carried an enormous sense of guilt since my son’s diagnosis. Did I somehow cause all this? Glenda has made that sense of guilt dissipate. By her actions of empowering me, it has caused a tidal wave of empowerment for my son and for my family. This letter is a tribute to the NACD coaches and especially and specifically to Vidya Guhan. My son on program is Nathan, who is now 19 years old and has Down Syndrome. We discovered NACD when he was 9 and have been working with NACD ever since. Having Vidya as my coach has made all the difference! Just as I wish I’d had NACD from the first month of Nathan’s life, I wish I had had Vidya from the first day of our program! Those of you who understand about auditory processing will know what I mean when I say Nathan was stuck. He was a 1 or 2 when we started and moved up to 3, and then 4 over the first couple of years. He had been at a 4, occasionally flirting with a 5, for many long years, with all the behavioral and learning challenges that entails. With Vidya’s help he is now a 5! And I’m hoping and working for a 6! Coaching has added short-term accountability, along with encouragement and real hands-on help with the daily details of implementing program. We have a phone appointment every 2 to 4 weeks and go down the list – what’s working, what’s not, any questions. Have I met my goals? I don’t let anything slide anymore, planning to pick it up again in a week or two “when things settle down.” There’s no more substituting something of my own design when a program activity isn’t going well. I know I’ll have to explain all this to Vidya in a couple of weeks! She helps me stay focused on the highest priority activities when there’s just not enough time/energy/whatever to get it all done. She helps me keep my energy up and stay positive and celebrate the progress (his and mine). She helps me problem solve when something isn’t working, and her ideas have been right on target (experience, intuition, training, perseverance…). She works with me just the way I’m supposed to be working with my son, so she’s a good role model as well. When I’m overwhelmed and feel as if I just can’t do it, she helps me break the job down into manageable pieces. Frequency, intensity, and duration…My coach Vidya is proving in her work with me and through me that the NACD approach works! Thank you, Bob, for all the years of programs, and thank you, Vidya for helping me work them! Thank you both for making such a great difference for Nathan and all those who love him! Has a football team ever gotten to the SuperBowl without a coach? Has a gymnast ever gotten to the Olympics who thought that he or she had outgrown the need of a coach? What I’m doing is tons more important than those things, and whatever will help me finish well is something I should use. I know my distractibility, my aversion to being bored, and the tons of other things that should be done. I rely heavily on my coach, Stacey, to keep me accountable, and she gets the job done. Lyn, Stacey, and I are a team with a mission, and each of us is an indispensable part.